California’s Napa County is well known for its wine industry and beautiful scenery. Between its lush green rolling hills and wildflower covered valleys, it easily ranks among one of the most naturally picturesque places in America. There is so much to see and explore throughout the area and when the timing is right, one of the main attractions can be found at Lake Berryessa. 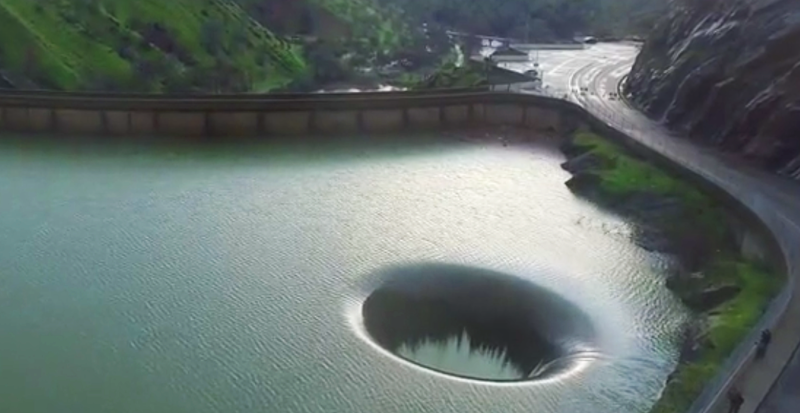 The seventh largest man-made lake in California is held back by the 304 foot tall Monticello Dam and is home to the famous “Glory Hole” spillway. Sitting just yards away from the concrete lip of the dam, the spillway is funnel shaped just like how a morning glory flower is, hence the name. At the opening and widest point, it measures 72 feet across before narrowing down to approximately 28 feet as it drops straight down two-hundred vertical feet! Once it reaches the bottom it bends ninety degrees and then straightens out before eventually draining out on the other side of the dam into Putah Creek. The last time the spillway was in action was well over a decade ago and with the ongoing drought conditions that California has been experiencing it was expected to be awhile before it ever saw any use again. All of that changed recently when January and February brought record amounts of rain to the region and raised the lake’s water capacity to near maximum levels. The sudden influx of so much water in such a short span of time meant that the glory hole was finally back in action and on February 16, 2017 the edge of it was officially runneth over! You have to check out this awesome drone footage to see what it looks like when thousands of cubic feet of water per second rush down the hole. It’s unbelievably mesmerizing and hypnotic and the power of the spillway is truly a wonder to behold. At one point in the footage the drone operator let it get a little too close to the hole and it almost ended up being sucked down into the dark depths. Check it out because this is something you don’t get to see all that often and it’s super neat! ← Which Body Part Do You Wash First In The Shower? It Says A Lot About Your Personality! These Are The 10 Richest Towns In The U.S.
How to Easily Grow an Endless Supply of Onions on Your Window Sill! The part of your body you wash first is your face and work your way down. It is for cleanliness. Why would you want to wash your privates or feet before your face? It has nothing to do with personality, it has to do with cleanliness. agreed, I start with my hair and work my way down, because I want the soap and water to wash away the dirt, not transfer germs from one area to the next.